Online privacy and security is a big deal nowadays and thanks to VPNs, you can encrypt your online activity. There are a lot of great Vpn apps and programs like AppVPN APK that work is a standard way. But some apps are taking a different approach. 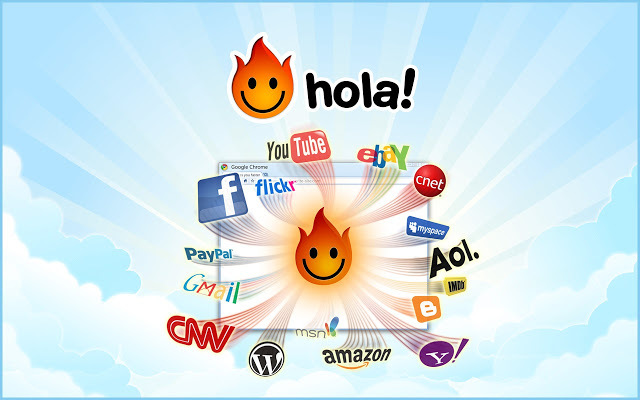 Hola VPN is one of those few online security apps that takes the privacy on next level. Today I’ll be sharing a link to the latest version of Hola VPN APK to download it manually and also I’ll review this awesome app. By different approach, I am not endorsing the way this specific app works because it is not a very ethical way, let’s just say that. Unlike a normal VPN which works in a client-server configuration, Hola is a peer-to-peer VPN app. Just to better understand, let’s see how a standard VPN connection works and then compare it with how Hola works. How a Normal VPN works? As mentioned earlier on this page, VPN works in a Client-Server configuration. Let me tell you what I mean by that. Virtual Private Network or VPN acts as a Tunnel between your computer or mobile and rest of the internet. That tunnel protects your Internet activity from being stolen. A VPN is basically a simple encrypted connection between your computer and the VPN server. All of your internet data packets are encrypted by the app installed on your end and then transmitted to the server. Next, the server decrypts those packets and send them to the destination. The response from there is a treated in the same fashion. If you are not using a VPN connection, almost all of your online activity can be stolen by a simple Network sniffer. Not to mention that law enforcement agencies can track your activities and see what have you been doing. Another drawback of not having a VPN is that you can not access content that is blocked in your country. Unlike normal VPNs, it uses a peer to peer configuration. The same way a torrent client will work. In this configuration, there is no server involved. Every user of the app is a client as well as a server. This allows Hola to have a lot more locations than any other service. Because if there are users of this app anywhere in the world, their internet connection will be used as a virtual private location. In other words, it uses your bandwidth to provide VPN service to others and others’ internet bandwidth to provide you the VPN connection. This can go horribly wrong if you think that anyone around the world can use your Internet connection to do whatever they wish. Suppose if there is a Network of online scammers using Hola, that Network might be using your Internet bandwidth for their work. Hence you will be held responsible for all of their actions because they are using your IP address. Tor Network also works in the same manner but tor tells you very clearly how it works. Hola VPN on the other hand does not. For your safety, I would recommend you not to use it but if you still want to use it, let me show you how to download Hola VPN APK and install it. It is available inside the Google PlayStore and it has a very good rating. You can download it’s apk file from the link given below. How to install Hola VPN? The installation is pretty much identical to what you would follow for any other APK. But using it can be a bit tricky. So I’ll also mention steps on using it. First of all, download the Hola VPN APK file from the link given above. If you are downloading it on your PC then you will also need to move it to your phone. Now you will need to allow the installation. By default, Android stops installation of apps from unknown sources but you can Enable it. Open Settings and navigate to Security section. Here you will need to enable “Unknown Sources” option. After that, open the file manager app and open the APK file. You will see the Android app installation screen. Press the Install option and the installation will begin. Wait for the installation to finish. Once finished, press the open button to launch the app. It shows you a list of all the apps that you have installed on your phone. Basically it allows you to change the VPN location as a per-app basis and does not tunnel the whole device. Suppose you want a Free VPN for Kodi on FireStick, you can install the Hola VPN and secure only the Kodi traffic without slowing down your Amazon FireStick completely. All you have to do it select the app from the list and then select the location from the list of countries. Press the open button and allow the device to be connected. It will then keep all of it’s traffic encrypted. To conclude I can say that it is an amazing app for Android and has some unique features like the option of using different locations for different apps. But as I told earlier in the review, it is not a normal VPN because they provide others’ internet bandwidth as a secure server to you and they will use your internet bandwidth as a vpn for others. This alone is a horrifying negative for this app making it almost useless. But in the end, it is your choice. That is all from our Hola VPN APK download & review post. If you found this tutorial helpful and you were able to protect your privacy online, make sure to share this review with your friends. Also dont forget to follow us on twitter @d_geeky for more updates like this one.